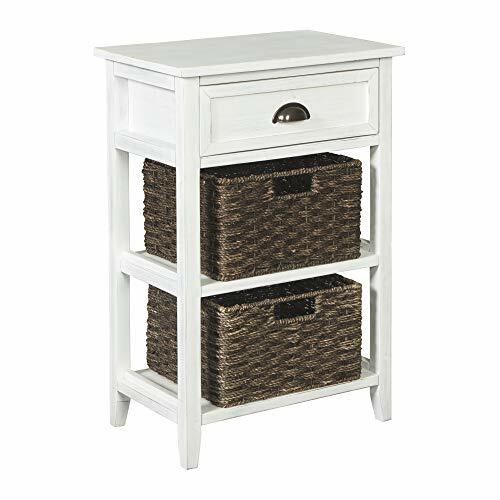 This vintage shabby chic inspired simplify accent table with a drawer in Antique White finish will add the feel of a family heirloom to your home. The carefully distressed finish adds character while the bronze finish metal knobs adds a layer of elegance. An array of finishes ensures you can find a table to compliment any decor palate. Try placing one next to your bedside to house an alarm clock, or next to the couch topped with a lamp and a color vase of flowers. 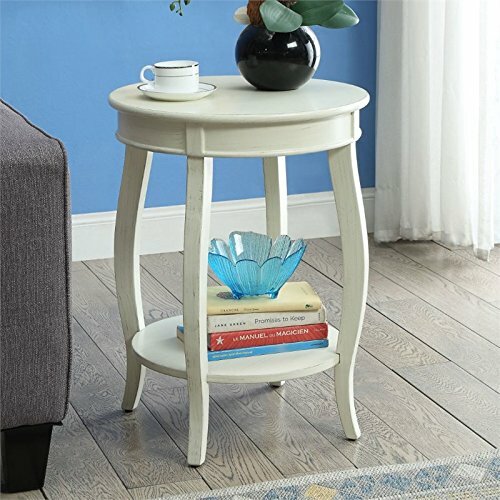 This compact end table measures 14 x 14 x 28", making it ideal for small spaces. Some assembly required. Less is more and this traditionally designed simplify oval accent table is the perfect example. Details such as the turned legs and distressed finish add the perfect amount of warmth and character to your home. 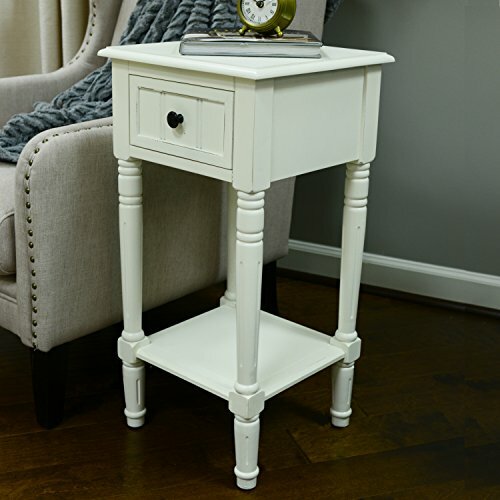 The Antique White finish is refreshing and neutral, making this a versatile side table, easy to transfer from room to room if your design palate ever changes. Use the lower shelf to display a basket or books while showcasing a lamp or other a collection of family photos on top. Constructed of solids and MDF for long lasting durability. Table measures 19.5 x 15.5 x 27". The traditionally designed Antique White pedestal table is the perfect round accent table to fill the blank space in your living room. Or maybe hold a vase of bright blooms in the Entry way, cheerfully greeting guests. Carefully distressed to add the right amount of character with out being overwhelming. The aged white finish is refreshing and neutral, making it the perfect chameleon table to transfer to any room in your home for years to come. A single storage drawer allows you to house belongings, keeping your home organized and clutter free. Solid and MDF construction allows for years of durability. Easy to assemble. Table measures 21.5 x 21.5 x 29.75". The country cottage style of the Kate and Laurel Idabelle side table will be your new favorite. It's the perfect style to complement everything from a modern city condo to a rustic cabin in the woods. A well-placed lamp or a funky accent piece will complete the look in a bedroom, hallway or anywhere in your home you need an unpretentious end table. The bottom drawer is deep and wide enough to store a few magazines or all your bedside necessities and the shelf will display an array of your favorite books or be the perfect place for that beautiful potted plant you haven't quite found the right spot for yet. Built and designed to last - yet lightweight enough to easily be moved around as the situation arises, this accent table can wear many hats. The dimensions are 27.5 inches tall by 22.25 inches wide by 13.5 inch deep. 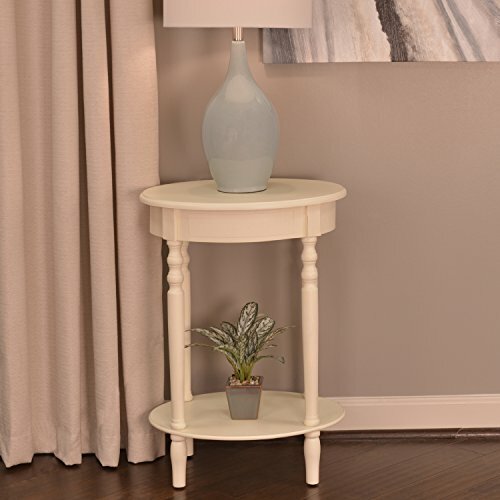 Create southern sophistication in any room by adding the rene white round wood pedestal side table. This beauty is crafted of white veneers and select hardwoods that accentuates its curvaceous pedestal base. Sized to make a statement in any room, this side table has a round top perfect for displaying your favorite pieces. Make your modern farmhouse or cozy cottage that much quainter with the slumber accent table in antiqued White. Pair of woven storage baskets enhance its casually cool sensibility, while cup pull adds a Retro-Chic touch. Be it in the home office or hallway, what a handy addition. Kings Brand Furniture - antique white/ walnut finish wood buffet cabinet console table add this Kings Brand Furniture console table to your home and add all the dining room storage you need.2 spacious cabinets hold six interior shelves perfect for storing books, DVD, and a/V components in the living room, or fine China, serveware, and crystal stemware in the dining room.Open shelves in the center of the design can be used to show off display plates and cookbooks, or wicker baskets full of children’ s toys to keep your carpets clear.For a perfect finishing touch, top the spacious surface with a blooming bouquet of Calla Lilies as a floral accent for any occasion.Dimensions: 30''h x 42''w x 12''dsimple assembly required. 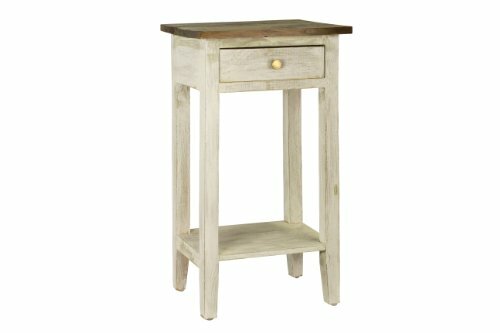 This lightly distressed side table is handcrafted from 100% solid mahogany wood. 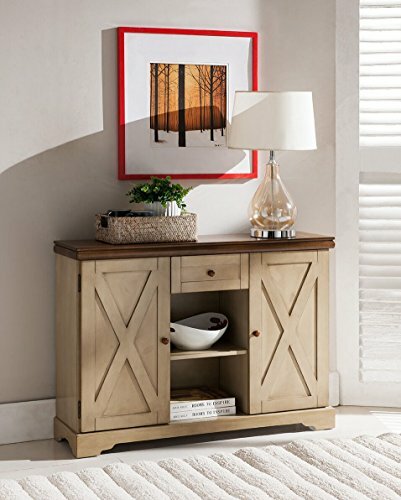 A European countryside feel, piece features a top drawer with a bottom shelf. These practical side tables are the ideal size for your living room, kitchen or bedroom. The light distress will give a rustic elegance to your home. This Alberta side table will be your favorite accent piece with its round top form and stylized legs. Offered in four different colors: Antique White, walnut, red, and teal. One is sure to fit perfect with your style. 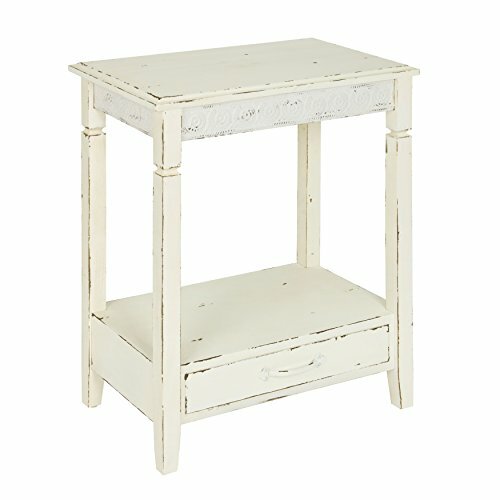 Shopping Results for "Antique White Accent Table"